Mr H.S. Banner was one of the original directors of the club in 1921, but resigned his position after five years. 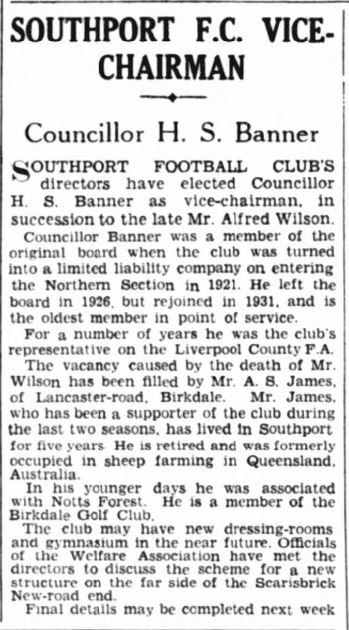 He rejoined the Board in 1931 and remained a director until 1953 when, at the age of 80, he was appointed a Life Member. A popular and kindly character instantly recognisable by his straw boater he had a greater insight than most people into the club’s ups and downs; he would often dip into his own pocket to subsidise the weekly wage bill when cash was short. Vice-Chairman between 1939 and 1953, he also formed and chaired the Finance Committee and rendered yeoman service to the club. A wine merchant by trade (his wife was also manageress of one of his branches), he was, like many of the Southport directors of his day, a member of the Town Council, representing Talbot Ward between 1935 and 1945. He was also chairman of the Southport Corporation Transport Committee.